We were marooned in Tin Can Bay for 2 weeks by constant SE gales. Some days gusts were over 40 knots. There are worse places to be marooned, but Tin Can Bay is a sleepy little community, the Yacht Club has some facilities but not well patronised by the cruisers, they commented the food is a little plain, and there is a supermarket 20 minutes walk from the dock, and not much else so the place is a little on the boring side. Begs the question why the profusion of cruising boats here, the reason is Tin Can is really the last free anchorage before the NSW border, and apart from Brisbane, the coastal towns with anchorages are few and those have strict time limits. Thus Tin Can is the choice for boats staying out of cyclone territory in Queensland. After 2 weeks the winds were still SE, but the forecast was for them to moderate. We don’t like beating into 30 knots but 10 to 15 knots is acceptable and this was the reason for us weighing anchor that morning and taking our chances over Wide Bay bar, which is a bar with some reputation. This is how you get out of the Great Sandy Strait to continue South, its either cross this bar or sail backyards going over the top of Fraser Island, adding 3 days at least to the journey. Ashiki raced with the current the 6 miles out of Tin Can in little over an hour and dropped anchor in a well protected bay just inside the entrance called Pelican Bay. It was the following day we embarked on the voyage over the bar, except we ran aground while still in Pelican Bay, with a falling tide… It meant a 3 hour wait for the water to come up again. By mid afternoon, afloat, we were heading towards Wide Bay into the flood. Being against the current is slower but at least the waves will be smaller than with the dreaded ebb flow. Ashiki had only one panel reefed each mast and motorsailing she was making 1.5 to 2.5 knots. Not too bad, if it hadn’t worked out there was the option of heading back to Pelican Bay. Wide Bay is a channel that runs the gaunlet of a huge line of breaking waves either side. It really is a horrible place. I was amazed that yachties consider this a regular route. One of the cruisers in Tin Can had his cockpit filled by a dumper while crossing here and I'm not surprised.. The trick is to sail along the channel, then pick the line to starboard weaving through the breakers. We watched several fishing boats pass and take the accepted route, they showed us the way. When it was time to turn all we could do is slide the hatch closed, latch the doors and sit tight in the cockpit. Ashiki did attack head on into some 2.5m steep walls coming at us, and her bows lifted over them everytime, but there were lines of breakers always directly ahead of us making us change course all over the place to avoid them. It was a stressful sail, maybe the most dangerous sailing we have done. It took 45 minutes to get through that heaving mass and out into smoother seas (not so smooth, but no dumpers at least! ), as I looked back at the bar, I saw a smooth patch of water curl inward away from us and smash into white spray. A breaker from behind is difficult to see, how does anyone sail the other way I wonder?? Wide Bay, not my favourite place..
We were on our way to Mooloolaba, just need a 6 mile tack out to sea to clear Double Island Point, Ashiki was surging through the sea when Susie noted the top panel of the foresail had a tear in it and was coming apart under the weight of the 6 panels underneath. This is not good, I’m pretty sure the sail isn’t going to last through the night. We built these sails without bolt ropes, using tabling only, which I realise now is a bit of a no-no. The Chinese designed their sails as a framework of battens and bolt ropes which take all the weight of the rig, the sail cloth is lashed to this framework but it does not take the load, the cloth is there to redirect some wind, thats all. Having a junk rig without bolt ropes is a bad idea and now we are paying the price. However, being a junk rig, everything about it is easily repairable. Susie dropped the foresail, leaving the main up she pointed Ashiki into the wind leaving us in a hove to position. I put on my harness, clipped in and walked to the bow with a length of 6mm line. Standing right on the bow roller with the deck heaving over 1m waves I felt very safe in the harness. I simply tied the yard and top batten together at the luff, walked back to the cockpit, raised sail and bore off, Ashiki ploughing through the waves once again. That line became a bolt rope for the top panel and the 20cm rip in the sail cloth went no further. I effected a near permanent fix while at sea in a few minutes. A rip somewhere on a bermudan rig would mean its going to rip the whole length or width of the sail and replacing the sail is the only fix, if you had a spare.. or motoring back to port. We don’t need to worry about it for now, plan to repair it at our leisure when in NSW, over 500 miles away (we’re sewing in webbing bolt ropes luff and leech). Even when the builder screws up the junk rig is unbelievably forgiving, repairs are too easy. There is the East Australian Current around here, somewhere, just not where we are. Ashiki was 9 miles off the beach but looks like we’re in the counter current, which flows the wrong way. It took a few more tacks to get around Double Island Pt nodding along at 2 knots in plenty of wind. I could tell its an adverse current because the tacking angles were 135˚. In other words we were going backwards on the outward tack. We finally cleared the point next morning and admired the hills on the coast was we headed toward Noosa. 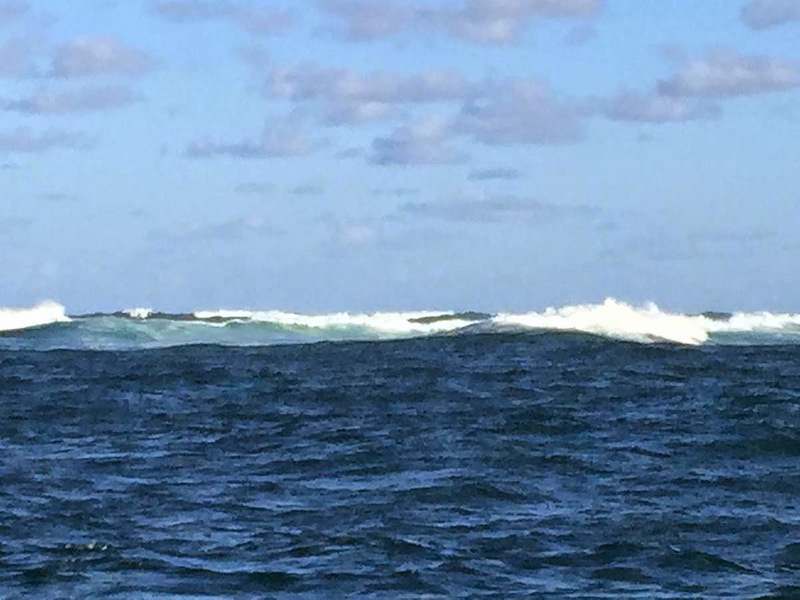 The SE was picking up again and Ashiki was riding a little rough, by mid afternoon we started to think of an anchorage at Noosa Heads. The guide doesn’t say anything favourable about the place, but at least it looks to be sheltered from the wind. Couple hours before sunset we were dropping anchor just inside the shark traps off Noosa’s golden beaches, there were surfers along all the breaks. No wind waves but there were long ocean swells coming in making Ashiki roll. Not perfect but settled enough to cook dinner. Then we saw the strong wind warning for Sunshine Coast region for tomorrow, do we really want to stay overnight in an unprotected anchorage? We decided Mooloolaba was the place to go since it has a calm river to anchor in but is another 20 miles, punching into everything. I estimated a good 10 hours to get there. After a meal and a little rest Ashiki was on her way again, pounding to windward in 20 knots now and tacking backwards, thanks to that counter current. Maybe 20 miles out finds the East Aussie current, we don’t know. We beat up wind through the night and by morning the winds were around 25 knots and the surface was more foam than blue water. This was becoming rough. Somewhere along the way I realised I had forgotten how to optimise sailing to windward. I had the more panels up in the foresail than the main, because the foresail always seems to do most of the work. For some reason I raised the main one panel (became 5 panels to the foresails 6) and Ashiki sailed 1 point closer to the wind! 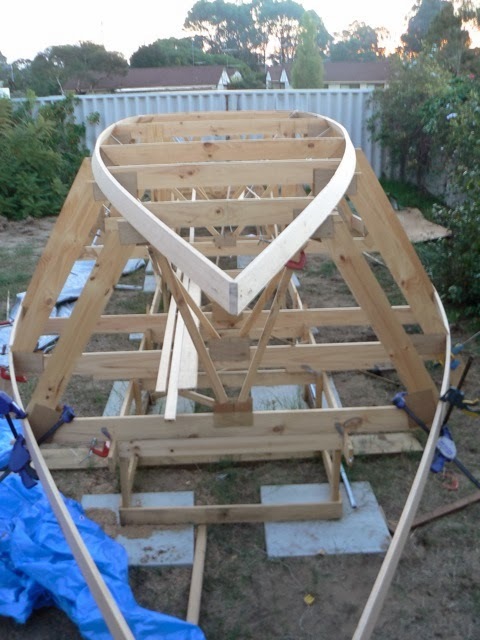 Raised another panel, so equal number of panels fore and main, she sailed another point closer.. (one point is approx 5˚). A new rule to never forget sailing schooner to windward - always keep the rig balanced. Ashiki at anchor in Mooloolaba. Interesting reading the guide book, it says Mooloolaba is an all weather entrance. No problems I thought, except... our book is 20 years out of date, since then the river had silted up, courtesy of the mangrove destruction and canal dredging, a bar had grown at the mouth and now rollers sweep over it! Furthermore, there is a crowd on the groyne waiting for unfortunate victims like us. It's a kind of Mooloolaba blood sport sitting at the river mouth watching yachts deal with the treacherous bar crossing. 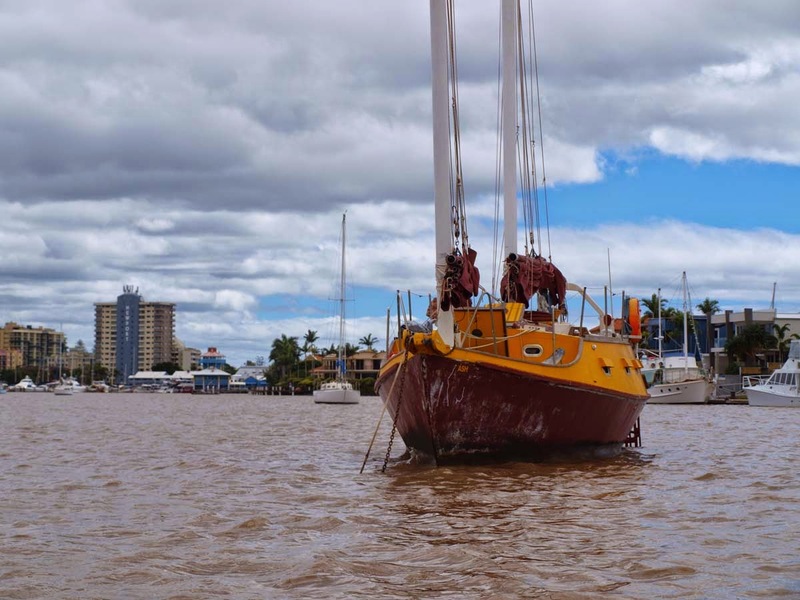 There appeared to be a lull in the breakers as we approached at 2 knots, against both wind and current, but that didn't stop a 1.5m wave lift and carry Ashiki 10m to starboard, at least she held her course and to her credit kept horizontal, no rolling, she eventually nosed into the river. Speed dropped to 1 knot with the motor at full throttle. The crowd, obviously disappointed we didn't capsize or something..., had begun to disperse and wandered slowly up the breakwater, over taking us. This is how we wound up safe and sound in the protected waters of Mooloolah River.